According to Gaza's Ministry of Health, over 1,400 Palestinians have been injured in Gaza by Israeli sniper fire since the rally began Friday. Over two dozen Palestinian protesters have already been injured on Saturday. 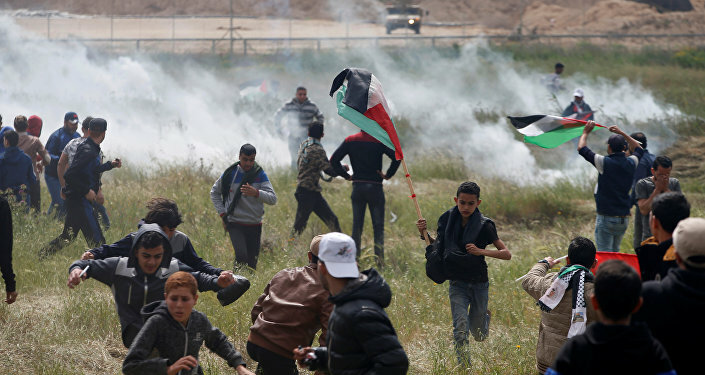 The protests turned violent after the first day, as forces under the direction of the administration of Israeli Prime Minister Benjamin Netanyahu deployed tear gas and used live fire to force back those approaching the security fence. "Medical facilities in Gaza, which have already been overstrained by the longstanding shortages of medical supplies, electricity, and fuel, are struggling to cope with the overwhelming number of casualties," Gaza's Ministry of Health reported, cited by Common Dreams. "The Great Return March" is dedicated to the so-called Land Day commemorating the day in 1976 when Israeli troops killed six Arabs protesting confiscation of their land. The event is expected to end on May 15, a day also referred to as the ‘Nakba,' meaning ‘disaster' in Arabic, commemorating the day hundreds of thousands of Palestinians were displaced after Israel seized territories during the nation's 1948 independence proclamation. Sarah Leah Whitson, director for the Middle East and North Africa regions for Human Rights Watch, recently said that "Israeli allegations of violence by some protesters does not change the fact that using lethal force is banned by international law except to meet an imminent threat to life," in response to Israeli snipers shooting and killing Palestinian protesters in Gaza. On Saturday, the Israeli Defense Forces (IDF) tweeted, "Yesterday we saw 30,00 people; we arrived prepared and with precise reinforcements. Nothing was carried out uncontrolled; everything was accurate and measured, and we know where every bullet landed." In response to IDF's Saturday tweet, Yousef Munayyer, executive director of the US Campaign for Palestinian Rights, tweeted, "The Israeli military tweeted they knew ‘where every bullet landed,' then deleted it, probably because there is video showing their bullets landing in the backs of unarmed protesters." Israel's chief army spokesperson, Brigadier General Ronen Manelis, announced on Saturday that Israeli forces "will not be able to continue limiting [their] activity to the [separation barrier] fence area and will act against these terror organizations in other places too." In a recent statement, B'Tselem, a Jerusalem-based non-profit organization that tracks human rights violations in Israeli-occupied territories, wrote, "the decision where and whether and how to demonstrate in Gaza is not Israel's to make." "Official Israeli statements have made no reference to the actual reason for the protest-the disastrous reality in Gaza-or to the right to free protest. Israel has the power to immediately change life in Gaza for the better but has chosen not to do so. It has made Gaza a huge prison, yet forbids the prisoners even to protest against this, on pain of death," the group added.